Share the Love #5: I'm Stuck on You - C.R.A.F.T. 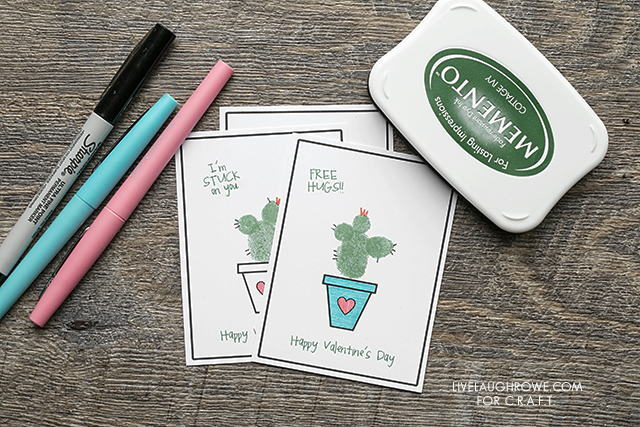 Today’s cheesy Valentines involves cacti and thumbprints, 2 of my favorite things! Last year Kelly whipped up 4 healthy fruit themed Valentines, perfect for the classroom! New here? Every Tuesday and Thursday until heart day we pick a clever saying off of this list of 150+ valentine ideas paired with small treats and whip up a little something crafty to bring y’all tons of valentines ideas! Hey friends! It’s me again, Kelly from Live Laugh Rowe. I usually stop by for the Share the Love series Jamie hosts each year. I’m always happy to spread a little extra love for the upcoming holiday. It is one of my favorites! Today I’m sharing a fun kid-friendly DIY valentine that includes thumbprints. 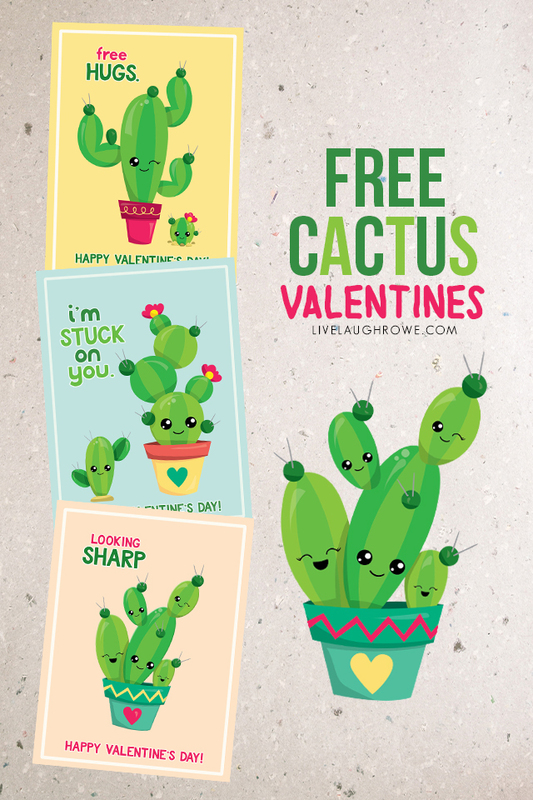 Seriously, how cute are these Thumbprint Cactus Valentines? I don’t have children, but I know if I did, I would be all-over the fun thumbprint art you can do. I think it’s ADORABLE! Sure, it can be a little messy, but it’s just too fun to pass up. Print off the printable valentine template and cut out. Next you’ll want to have your child use his thumbprint to start the cactus — then maybe use his pinky finger print to do smaller ones off of the large one. Use the black fine point marker to create some of the thorns and maybe an orange or pink marker to create a colorful cacti floral. You might want to color in the pot as well — and the rest is already done! 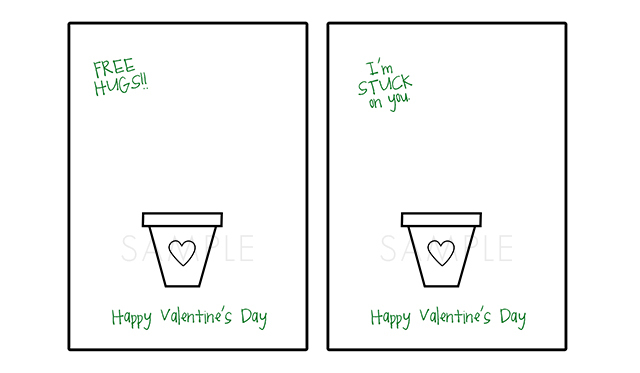 Cute puns and valentine wishes are already included on the printable. Woo-Hoo! Please Note: All printables and downloads designed by Live Laugh Rowe are for PERSONAL USE ONLY. Please do not alter the file or claim it as your own. This file is not intended for resale, nor are the printed versions of this file. 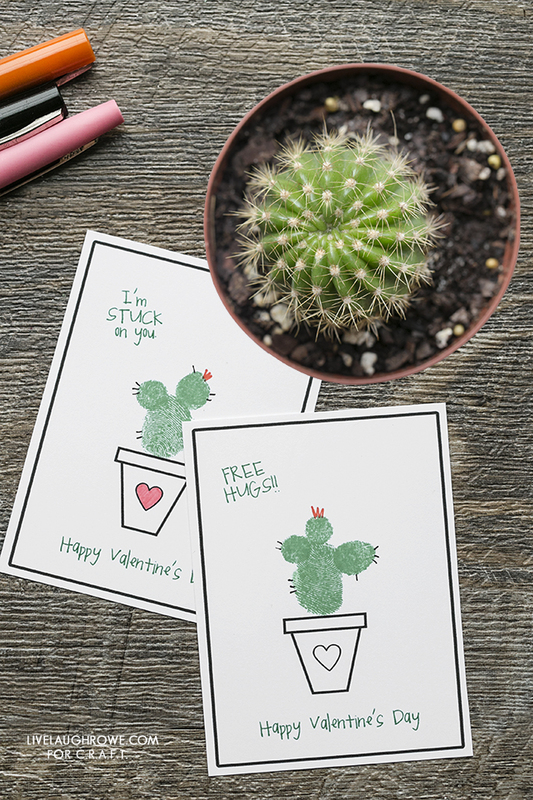 We all know that sometimes handmade valentines are a little harder to squeeze in, so I have these adorable Cactus Valentines for you on my blog. A little less work, but just as cute. Decisions, decisions! Wishing you a Happy Valentine’s Day — and a BIG thanks to Jamie for having me! Stay sharp! These Valentine’s cards are adorable. Thanks for sharing your Valentine’s ideas with us at Snickerdoodle. Pinning. How cute are these!! My fave is “I’m stuck on you!” haha Thanks for sharing with us at Share the Wealth Sundays! Love these, esp. living in Arizona where we can’t escape the prickly cacti! Pinning. Visiting from Monday Funday party. How adorable are these Valentines Day cards. I love it. 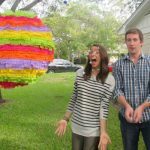 Thank you for sharing at Dishing it and Disgging it linkparty. You’re my feature this week! 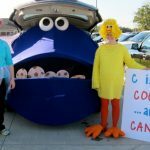 Thanks for sharing on the Family Joy Blog Link Party! Hope to see you link up with us again. 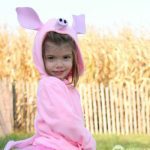 You are being featured at Family Joy Blog Link Up Party on Sunday. Yay! how fun! My 10 year old is looking over my shoulder, I think she may want to try these herself. Thank you! I love this idea and it looks easy enough for me, the non-crafty mom. These are so cute. 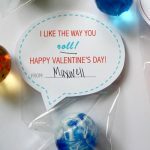 I think they might be my favorite Valentine printable I have seen this season! Pinned and sharing! Thank you for joining us at Family Joy Blog Link-Up Party last week. I hope you will join our next party starting Sunday at noon EST.